So for our fifth anniversary, we did “ghosts”. Ben booked us a haunted hotel room at the Queen Anne Hotel in San Francisco, room 410, and stuff started happening right away. That night, we took a haunted walking tour, hosted by Jim Fassbinder, the gentleman who walked TAPS through Alcatraz on “Ghost Hunters”. 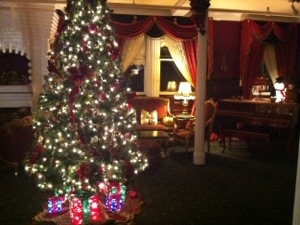 Because we had gotten the haunted room, we allowed the tour to go into our room. I lifted my camera to take a picture, and something flew across the screen. Three of us saw it on the camera screen, but Ben, my hubs, saw it with his naked eye,but I wasn’t fast enough to catch a pic. It was white and round and moved very strangely, in a zig-zag. 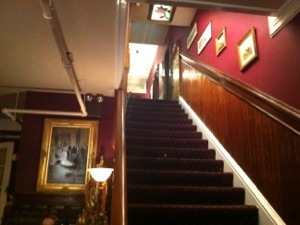 It was a pity we couldn’t capture or recreate it, but having it witnessed by a famous ghost hunter was pretty cool. That night we downloaded an app called Ghost radar (an attendee of the tour told everyone about it), for a gag. It uses the motions sensors, light sensors, and temp sensors of the phone to “read”, and it talks. We walked through the hotel with it, and thought it was defective, as it didnt talk ANYWHERE, but as soon as we came into 410, it started talking up a storm: the first thing it said, of all the words in the english language: “dawn” which just happens to be the name of my newborn niece, who is still in the hospital. You should know the hotel was built as an all girls school, and that the ghost in 410 is known to be very “compassionate” toward ill children, and is known to “tuck people in”. I kept a record of all the words the app said, and there were a ton! Then late Friday night, at about 3am, I gave it up for the night. I had been using my husband’s phone to play the app. My phone was plugged in, sitting on my bedside table. I was sending my phone text messages from Ben’s phone with the words, and watching my phone light up as I sent them. So I was tired. I got my final “message” from the ghosties and set my husbands phone next to mine i laid back for a few minutes, but I sat up to straighten my pillow. I looked down. My phone, still plugged in, was laying on the floor. I heard nothing drop, and my phone has a grippy case that does not slide. My husbands phone has a slick case, and was still sitting on the table. The last thing the ghost app said before i turned it off was “aside camera edge dangerous.” At the time, it made zero sense, but in retrospect… I’ll let you see what you think of that. It creeped me out. I asked to switch sides with my husband. Shortly after we moved, both my husband and I heard what sounded like a little girl laughing, coming from the right side of the bed. I thought it was just me until he said “I heard it too”. Then a few minutes later, we heard it say “Hello” and then giggle. I heard, about 20 mins later, a loud and exuberant conversation between a man and a woman, coming from the center of the bed, though no words could be discerned. 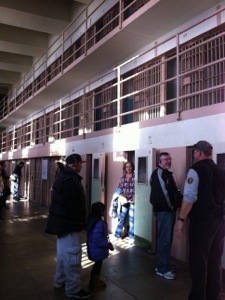 Then Saturday we went to Alcatraz. We didnt remember to run the app, but I heard someone whisper “Hey” really loudly over my headphones. Back at the hotel, we took the phone down to the lobby for afternoon sherry, which is a free perk of staying at the hotel. We decided to see if the ghost app could hear anything. We let it play, but got nothing. My husband was getting tea, and asked if I wanted to explore. I said, “okay but I’m going to refill my Sherry glass.” and the phone suddenly said “enough” when it had said nothing for about 20 minutes. I laughed and said “apparently the ghosts don’t realize that many things about women have changed since their century”, to which the phone immediately replied , “Dress”. 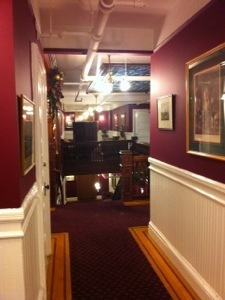 After the sherry incident, we decided to walk through the entire hotel to see if we could catch anything else. My husband was particularly surprised that we seemed to only catch things in the lobby and our room. So we walked through the entire hotel, with no hits. We were sitting on a three-seat pew at the end of a long hall, next to room 401 to see if anything happened. We waited. No hits. Just as Ben said “Well, nothing’s happening.” The hallway window about ten feet away, leading to an enclosed skylight channel, suddenly SLAMMED open. We looked at each other and went over to it. We checked it for movement, and it is an old-fashioned, sticky wooden-sashed, HEAVY window. It does have a springy, couterweighted aystem though. If you jump up and down beside it, you can trigger it to open, but it does not open on its own. we were ten feet away and had been still for some time, so it may be that the “ghost” was using the ease of the opening window to communicate, or it could be that some movement below, or indeed in any part of the hotel, had triggered it. However, the staff had never heard of this happening before. We went back into the room and caught some pretty weird stuff. The app said “establish evidence toy” just as I laid the recorder on the bed. So i turned my digital recorder on and listened for a bit. I got two EVP’s: both in the same 4 minute long span. One is a third voice saying “Walter” and anoter says “Ah!” right over ben’s voice as he is explaining the recording device. There were long strings of words. One said “hair” right as i picked up a brush to do my hair for dinner. Dinner was at a restaurant called “Opaque” and took place in a dining room that was PITCH BLACK, and the waiters were all blind. It was way cool. I fit right in, and my waiter loved the fact that she didn’t have to train us on how to manage. I was already prepared. After dinner we did more ghostly things. We bought booze and went back to the room, walked the hotel, got great word strings. Today we went pub hopping and ended up at a pirate ship bar. Finally, we took one more hotel walk with our glasses of complementary sherry. We got nothing until we sat down on some couches on the fourth floor near the elevator. There were no hits. I finished my sherry, as we were talking about how to interpret the words we were getting. Suddenly, it said “pour”. I laughed and said “I think it wants me to drink more sherry,” and bing the elevator opens. No one in it. It sits there, closes, and then went no where. We thought surely someone on another floor had called it and it had just gotten confused or something, but no, it sat there until we got in it and went back down to the parlor. Back at the sherry decanters, we got a ton of hits all relating to sea travel “boat, captain, log, steam, chart” and it was all localized around the sideboard. I don’t know what to make of the app’s word find feature. I have no idea how it works. What I do know is that both mine and ben’s phones got readings at the same time that were not influenced by cold, heat, electricity, or movement. Our readings were localized, and they corresponded with other phenomenon. The winners to me were the phone, window, and elevator moving on their own. However the app said several names, all of which were close family members: James, Henry (James’ middle name), Sally, Dawn, Joe etc.